Arriving just before 10am, the large building was jam-packed, with perhaps 700 or more people crammed into every available seat, including pews around the walls encircling the many banks of pews facing forward. Additional chairs were being brought in and placed in empty spaces, and some people—like myself—sat on the floor. Panorama of the interior of Wangaratta Cathedral by John Townsend. View the 360° panorama here. The jazz mass featured both performers advertised in the programme, Clayton Doley and Tina Harrod, whose song punctuated the flow of a structurally traditional, though carefully parred down, communion liturgy. People were welcomed by the dean of the cathedral, who made several wisecracks in his introductory comments and was met with warm laughter. The preacher was an archdeacon in the diocese—a migrant from South Africa—who opened his own talk with an analogy to the US Episcopal Church’s presiding bishop, Michael Curry, “upsetting” people at a recent royal wedding with his talk. So “you don’t know what you’re getting,” he quipped. The presider was the local bishop, who acknowledged at the start that the service was “touched” by a tragedy—it seemed a young musician to be involved in the band had been killed, with others, in a car crash the previous day. So “we celebrate with joy while our hearts were breaking,” the bishop suggested, with a warmth of engagement characteristic of the leaders throughout this event. The animated bishop himself boogied in his seat, twisting in his chair, swaying his head. Once or twice, he stood up to dance, and encouraged the congregation to clap by thumping his hands together above his head at various points. He repeatedly praised the musicians—for example, saying at the end, “you have enriched our worship and strengthened our spirits with your joy-filled music”—to evident appreciation from the crowd. His modelling of a relaxed approach was reinforced in various ways, like announcing that the “noise of children didn’t bother [him], and [he’s] the boss” (albeit a perhaps rather strange announcement for a liturgical servant of the assembly?) and walking around towards the close of communion, to approach people, myself included, and ask “do you take your communion?” (an interestingly-worded question). It seemed in a whole variety of ways that many persons in the congregation on this occasion were unfamiliar with liturgical traditions, and that the cathedral was making accommodations to this fact. I praise them for doing so. The music to which the bishop—and perhaps others? I couldn’t see from the available space on the floor where I sat—danced, was always loudly applauded, and it was an interesting mix of performed songs by the two lead musicians, punctuating various points in the liturgy, and assembly songs accompanied by the band of young musicians. The choices of song seemed sometimes tenuous, though also apt. So in the gathering rite, the performers sang a song called “We’re still changing,” which served to invite an openness to what would take place. At the preparation of the table, they performed a song called “lilac wine”—with apart from the reference to wine, no obvious connection to sacramental spirituality in the Christian tradition. And after communion they sang again, this time a song that repeated the word “alleluia,” though with no other discernible connection to the liturgy. Songs led by the schools’ band did have stronger connections to a recognisably Christian repertoire, particularly the opening “Just a closer walk with thee,” and closing “When the saints go marching in.” Other congregational song was notably smart for having religious resonance without much distinctively Christian context, presumably carefully chosen to invite wide participation without heavy doctrinal notes. So though “this little light of mine” included a verse “Jesus gave it to me, I’m gonna let it shine…,” other songs expressed certain kinds of commitment without naming their Christian influences: “I’m gonna lay my burden down by the riverside” had people repeat “I ain’t gonna study war more” over and over—what’s not to like?—while its other words had them trying on starry crowns, putting on golden shoes, watching fire blaze… hence, the theologically literate might hear allusions to scripture, the unknowing imagining themselves at some celestial party. In preaching and in song, then, it was evident that this service was wrestling with hospitality to a wide range of people while retaining some Christian distinctiveness. And something similar went on with the texts of prayer. 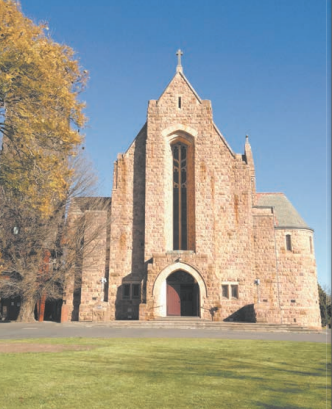 The order suggested that the words of the service were “adapted” from A Prayer Book for Australia, the closest thing that the Anglican Church in Australia has to a form of common prayer. However, its selections from APBA were quite minimal (with, notably, no creed), were sometimes replaced by local compositions, and, above all, were short. The preacher at one point explicitly acknowledged that the jazz mass was “moving away from our traditional way of doing things” (to which he added “towards what we call in Africa, ‘African jive’”), and at one telling point the bishop asked people to “please be seated” only to look up and observe with surprise “…but you are!” This seemed like a key clue to the “gap” between expectations of people’s familiarity with customs usual in the cathedral and the make-up of the gathering on this day. Very occasionally, there were jarring moments, such as while relaxing lots of the liturgy, retaining the jangling of sanctus bells in eucharistic prayer (as an aside: in any case hardly to be commended in a contemporary Anglican liturgy), and most strikingly placing a choral piece of music (some version of psalm 148?) around the communion. This choral incursion had no resonance with jazz, and so with no other music elsewhere in the service. I wondered why the choir had not themselves attempted a contribution in the spirit of the rest? At other points, I witnessed struggle to include the unfamiliar: so while suggesting that “all communicant Christians” were welcome to share in communion (itself a slightly different message from “those who are baptized in any Christian tradition” printed in the order of service) the bishop emphasised that “all are invited, all are welcome” to share the bread and wine of communion, and also (as noted above) approached people to ask if they wanted to partake. This Jazz Mass seemed to me to model the kind of struggles that many Christian congregations in Australia need to make their habit, focus and priority: to be present in the life of the wider community, and not to conduct their worship divorced from wider cultures. However their particular predilections might lead them to make different kinds of compromises of their tradition, customs, style and content, the Wangaratta Jazz Mass had at the very least enabled jazz enthusiasts to be present and stay engaged. I was glad to be there. Banner image from the Wangaratta Jazz Festival website.